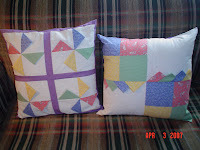 I made the two pillows on the left for my granddaughter Hailey. They match the pillow cases she uses on her bed as pillow shams. The material was left over, so why not? I also worked on a service project at quilt retreat, as did many other ladies. We made lots of hats for people who are under-going chemo or radiation treatments. 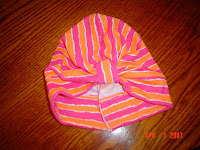 To the left is a sample of one of the hats. They are so easy to make!